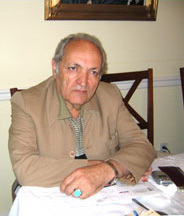 Khosrow Seif is a well known opposition figure in Iran. He entered politics at the age of 16 and was the long time political companion of Dariush Forouhar. He became the head of Mellat Iran (Nation of Iran) Party after the tragic death of Forouhar. He has been incarcerated several times. The last time was shortly after the student uprising at Tehran University in July 1999. He and many others were taken from their homes or while walking in the streets of the capital and jailed without any clear charges against them. The fact is that in the Islamic Republic of Iran, you don't need an official warrant to arrest anyone. There is no justification to arrest, imprison, or torture anyone. It is the law of the land! On a personal visit in the U.S., Seif talked briefly about current issues. He began by recollecting the dreadful day in November 1998 when Iranians at home and abroad learned of the news of the murder of Dariush and Parvaneh Forouhar in their home in the southern part of Tehran. This past November, the annual memorial service for the Forouhars and other murdered intellectuals and writers was prohibited by the Iranian authorities. Shocking day: On Saturday, 1st of Azar, at about 4 in the afternoon, several people from the Bazaar who were acquaintances of the Forouhars were supposed to meet with them at their house on Hedayat Street. They rang the bell several times but no one showed up. They became worried. One of the guests climbed the wall and went into the house. He returned, shocked and shaken at the appalling, bloody scene he had just seen. They called me immediately; I knew something was terribly wrong. I took a taxi as I was unable to drive under the circumstances. We arrived there, but they didn't let us in. People from the Ministry of Information and other Ministries were inside the house, taking finger prints, collecting evidence, etc. No one was allowed inside. We contacted Parvaneh's family. It was the worst day of my life, everyone was crying in disbelief. The 24 hour radio, the BBC and other international news agencies reported the tragic news to the world. It was almost midnight when everyone had come to the house, and we were finally able to enter and survey the horrific scene. Relatives, Parvaneh's sister and mother, and friends like Mr. Sehabi, Mr. Tavassoli, Dr. Boroumand were all there. We were standing on the front porch which faced Mr. Forouhar's office. Dairush was sitting in his chair, his back to the chair and his mouth wide open. Parvaneh who had been very ill at the time was upstairs in her room, on the floor. Twenty four stab wounds on her body showed that she had struggled against her murderers. She was a fighter to the end. It was our conclusion that on the 30th of Aban, at about 10:30 in the evening, two people who claimed to be concerned about a stolen car had entered the house. The other nine or ten perpetrators followed. We believe that there were a total of eleven people who were involved in the crime. (A friend of the Forouhar's, Dr. Sepehri who was the last one to see him had gone there to arrange for flowers to be sent to the Embassy of Italy. The Italian government had just released a famous Kurdish/Turk leader and Mr. Forouhar had been involved in the negotiations. The last fax had been sent around ten in the evening). Mr. Forouhar had asked Dr. Sepehri to stay for dinner but seeing that Parvaneh was ill, he decided to leave. The perpetrators had taken their time to do what they had planned. They broke one of Mr. Forouhar's arms and then stabbed him, sitting him in his chair. Subsequently, they went after Parvaneh. The Forouhars had a small dog which was taken to a room and locked up. It was obvious that the people in the Ministry of Information were involved. It was their work, no doubt. We learned later that Saeid Emami (Eslami) had submitted a report to the the ruling elite in 1374 which pointed out that the following five years would be dangerous times for the Islamic Republic and several political groups and individuals were to be targeted. The report specifically warned the officials of the threat the Forouhars posed. He had warned of their outspokenness and their house becoming a center for the opposition. Indeed, their house was under surveillance twenty four hours a day. The night of the murder, their immediate neighborhood was watched from 4 surrounding mosques. When one of the guests had gone into the house to find out why the couple had not opened the door, there was a telephone call; no one was on the other side of the line. I guess they wanted to make sure that someone now knew of what occured, of the crime that had just taken place. The house became a crime scene and government officials prevented any entry. Thus, everyone who knew the Forouhars came to my house. People who didn't even know them were crying. No one could imagine that this famous couple who had lived and fought courageously for their country were really gone in this most brutal and tragic way. The couple's two children, Arash and Parastou, arrived from Germany. They went to see the wounded, lifeless bodies of their parents at the morgue. I could not make myself go see the two people I had admired and worked closely all my life in that condition. I never imagined I would be in the position of planning for their funeral. The funeral was attended by thousands, all political parties and affiliations, all carrying their photos and openly shouting their defiance. I remember seeing the late Mohammad Mokhtari, who was to be the next victim of what is known today as the serial murders. It was the first show of open opposition to the Islamic regime. Arrest in the serial murder case- the government, after an initial investigation arrested 18 perpetrators. We don't really know whether their identities were real or they had faked their names. What we know is that there was a Fatwa-a religious decree to kill several people. My name was also on this list. Unlike what the officials wanted everyone to believe, this was not the work of a few rogue agents inside the ministry of Intelligence, but occurred with the knowledge and consent of higher officials: it was a religious Fatwa. The trial was a mock trial and the documents presented at the trial had been tampered with. Some crucial evidence was omitted and for obvious reasons the victims' lawyers and relatives boycotted the trial. We never saw the faces of those charged with the crime. Two individuals, named Kazemi and Alikhani (possibly alias's) belonged to the Ministry of Information. Apparently, they are still in prison, but no one really knows. There were lots of rumors going around. The government officials even claimed that these murders were the work of 'Zionist' elements working for foreign governments; they had committed the crimes in order to discredit the Islamic regime. The fact is that these crimes were committed on the order of the highest echelon of the ruling elite. What happens in a country is the responsibility of the officials of that country. They are the ones who are directly accountable to the people. In this case, Dori Najaf- Abadi who was the head of the Intelligence Ministry was spared and he did not have to be accountable to the government or the people. Although he was replaced by Younesi , later he was rewarded a higher position. He is now the country's general prosecutor! The serial murder case is an open case to this day. Consequently, like so many other political cases in the last decade which have never been solved, the handling of this case is in fact in direct violation of the Constitution of the Islamic Republic. People want to find out what really happened and who were behind these murders. This is now a political/national dossier. Protests and arrests- only five days after the incidents at Tehran University, I was arrested. The student protest in July 1999 was at first peaceful and only turned violent when provocateurs of the regime attempted to identify the student activists and their leaders. In order to do so, the security guards viciously attacked their dormitories while they were asleep. The sacred grounds of the university were violated by thugs of the Islamic regime. The students' demands were basic. They protested the new law passed in the parliament regarding more restrictions on the press and the banning of Salaam newspaper. But in fact, as previously planned, the armed guards and security forces intervened and we all know what happened to the students. Hezbeh Mellat issued a declaration condemning the attacks; members of our youth organization had also participated. A few days after the bloody incidents at Kouyeh Daneshgah, me and some of our party members were arrested. Eight men came to my house and took everything, even pictures that I had with the Late Forouhar from almost 50 years ago. Without an official warrant, they took me to Towhid prison. Then they arrested Mr Namazi and Mr.Mehran Abdolbaghi at their homes. Mrs. (Dr.) Jeylani was arrested while she was walking in the street. In prison we were tortured, not physical but psychological torture. Sometimes, there was physical torture, sometimes psychological torture, and then the two combined. In my case, I was kept in solitary confinement for six months in Towhid. I could hear my son being beaten next door. I could hear his voice. I felt helpless and could not sleep. They did the same to other prisoners: a new method of breaking their spirits. But I found out much later that all the voices I heard were actually a recording. They had somehow used a voice similar to my son's, making me believe that he was in the adjacent cell, being beaten. One day, while coming out from my prison cell to attend my trial, I asked one of the guards to give some fruits to be taken to my son. He said your son is not here. He and your family will be coming to visit you shortly. All this time, I was under the impression that he was next door to me. I knew of other prisoners who had similar experiences. Using this same technique, they would make us believe that our families were being tortured. They had used similar methods on Mrs. Jeylani: they had used tapes making her think that I was being thrown out of a helicopter, in order to extract confessions from her. She was asking to see her brother whom she thought they had executed; she wanted to see the corpse. None of it was true. It was all a tape. Unbelievable! Yet, in our minds it was quite believable. At my trial, I was charged with instigating the bloody incidents at Tehran University and condemned to death. Later my sentence was lowered to 14 years. I spent close to a year at Towhid and Evin prisons. During this time, I had heard that they dealt most violently with the arrested students. They had tortured them severely, like Batebi, Mehrdad Lahrebi( who just had a small book stand outside the university) and the Mohammadi brothers. They are still in jail as I speak. Coming elections- our party has repeatedly boycotted the elections since 1378. We never believed that we should give legitimacy to an election where people can not choose their candidates freely and their only choices are those already handpicked for them. We also believe that the main obstacle is the present Constitution and the existence of the Guardian Council. As long as these gentlemen appoint the candidates and offer them as the only options for the people, then such elections can never be legitimate. Even the late Forouhar had denounced the last election. Therefore, I would argue that we will not give our blessing to any bogus elections. Ninety percent of the time the struggle is within the two "fronts" but they are just bickering amongst themselves. They create this false pretense that there is real opposition in order to deviate from the real issues. It's always been a way for the regime to manipulate people. Now the alternatives are people like Velayati, Larijani, Karroubi, Dr. Moin; they are the khodis. We are not even considered as Khodi. We are the 'Gheir Khodi', the outsiders; we are illegitimate in their minds. We are outside of the political scene. Basically, we are citizens without any rights. Mr. Khatami's last speech at Tehran University was a decisive and final message to the students and to the people of Iran who had invested so much in his presidency that in fact he was there to reform the system. He has always protected the system and came to the rescue of the Islamic Republic. What Mr. Khatami promised during his tenure never took place. In my opinion, he was a symbolic figure to deal with the Europeans and other nations. He was chosen to make the deals as the others didn't have any credibility in world public opinion. The war with Iraq and the election of Khatami prolonged the life of the Islamic Republic. My contention is that just like Rafsanjani handed the Presidency to Khatami eight years ago, he will now take it back from him. I have a hunch that Rafsanjani will be elected. Nuclear Energy: Nuclear technology or obtaining nuclear energy for Iran is nothing new. It started long ago. Even in the late 1950's people were sent abroad to study the science. They came back to Iran and in the 1970's Iran had a group of professional technicians in the field of nuclear energy. During the Pahlavi era, Iran was already working towards obtaining nuclear capability and was trying to become a nuclear power. In the 80's and 90's, the Islamic regime was openly developing the necessary means to make nuclear energy. It was not hidden from anyone. Such knowledge and power helps the economy of a country if it is used correctly. However, my argument is that this government does not and has not worked for our national interest. But, if used properly, having the nuclear technology is beneficial to the economy of our country and will help all Iranians in the long term. This is a national question. We don't believe that governments should use their military power to control others or strike at others. Yet, we don't think double standard should exist. In the past 25 years this government has not protected our national interest, for example in the Caspian Sea. We have given up a lot of our rights. Yet I don't believe that any kind of outside intervention is the way to overcome what may be wrong. Throughout history Iranians have proven that once confronted with military or foreign intervention, they will fight back and this is something that must be understood. We hope no foreign power will intervene militarily because then all Iranians will stand together. These are very sensitive times for all of us and we must think and act rationally. Any intervention will only benefit those in power. Opposition: It is a complicated task to accomplish anything in a closed society and there is obviously much disarray within the opposition. Groups that share the same interest and hold to the belief that Iran is a sovereign and independent nation must form a united front. Once there is unity among those who hold the same ideals, then there is room to work with others who do not necessarily share the same political ideology. We can cooperate with various groups under a common banner (I think the National Geographic was a good example) and we can have unity in practice. Nevertheless, we can not allow those who hold to beliefs of the past to impose their will on anyone. More than anything else, our society needs freedom in every area in order to flourish. Freedom has been caged, we must open this cage. Nothing is more essential than having the freedom to choose without condition and for the most basic human rights. There are many challenges ahead of us and we have to be practical in dealing with all of them. We do not have any desire to engage in violence or violent movement. If violence takes place, it will solidify the regime. We have not signed to the referendum movement as of yet. I don't think the current political atmosphere in Iran is ripe for a referendum. There must be more organization, more awareness. Referendum is a good slogan and we don't disagree at all with the core principle but we must carefully prepare the foundation for such a referendum. Any referendum must address the complete segregation of State from religion and the type of government for Iran should be the choice of the majority of Iranians. At times, Mr. Seif's Iran's Nation Party has been criticized for being national - chauvinistic, even while Dariush Forouhar was alive. However, Mr. Seif who is still a firm believer of Pan- Iranism contends that this only means the unity of Iran as a sovereign nation with respect to its diverse culture, ethnicity and religions while recognizing its territorial integrity. His party is against any form of aggression or meddling in its neighbors' affairs or the spreading of its political or religious ideology beyond its borders. According to Mr. Seif, Iran's Nation Party believes in working closely first and foremost with those nations who share the same values, language and culture as Iran. But at the same time, he believes in full cooperation with other nations with mutual respect, working on economic trade, international issues, and recognition that Iran can be part of the civilized community of nations once it is free of any type of autocratic and theocratic rule.